Description: The Tactical Supergrade is a combination of breathtaking aesthetics and functionality within a single pistol. With the beauty and workmanship that have made the Wilson Combat® Supergrades the standard to which all other custom pistols are compared, the Tactical Supergrade is handcrafted from carbon steel for use as the ultimate defensive handgun. The Tactical Supergrade sophisticates the world of handguns, and is the finest full-size defensive pistol in today's market. 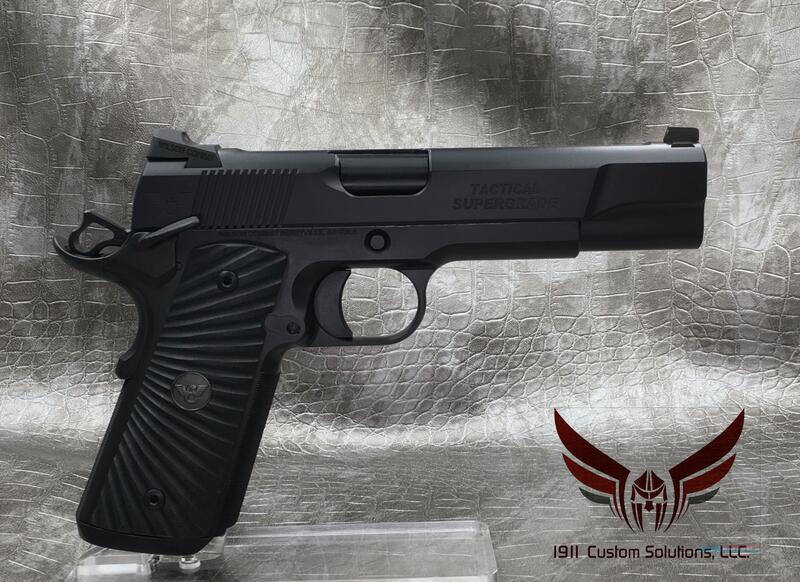 This Tactical Supergrade is a 100% custom built gun made for 1911 Custom Solution's. We are an Elite Dealer for Wilson Combat, Les Baer Custom, and Ed Brown Products. You can purchase our available inventory anytime at our internet store or make an appointment at our showroom in Houston, TX near the Galleria.